The Chicago International Film Festival is in full swing, boasting 175 total films hailing from all corners of the globe. CIFF isn't the most lauded fest in the country, but you can always depend on it to bring some of the most anticipated art-house films of the year in addition to a few forthcoming Hollywood options. There's also always a good chance for adventurous viewers to discover something new. CIFF might not get all the "name" films the other festivals do—although such familiar names as Kiarostami, Reygadas, and Weerasethakul can be found on this year's bill—but it's often able to pick up the kind of films the other fests pass over. Here are the films I'm most excited about. 5. Night Across the Street (Raul Ruiz, Chile/France) While I'm regretfully unfamiliar with the bulk of the late Raul Ruiz's work—though it's worth mentioning his oeuvre boasts more than 100 films, so I reckon I'm not alone in this—I'm very much intrigued to see this, the last film he completed before his death. Described as his most political film in years, it tells the story of an office worker who relives memories from his life—memories of events that may or may not have actually happened. Ruiz is known for his labyrinthine narratives, but his grace as a filmmaker is likely to override any inherent wariness you might feel toward his seemingly complicated style. Evoking dreamlike nonlinearity and a healthy dose of melodrama, his films are some of the most pleasurable and robust you're likely to see. 4. Like Someone in Love (Abbas Kiarostami, France/Japan) A new film from one of cinema's greatest living filmmakers is always a cause for celebration, and Kiarostami's latest is no exception. Like Certified Copy, which also screened at CIFF, this film is set outside of his native Iran; while Certified Copy took place in relatively nearby Tuscany, Kiarostami chose Japan as the location forLike Someone in Love. It's garnered a mixed response, playing to divided audiences at Cannes and the Toronto International Film Festival, but a new Kiarostami is still a can't miss. 3. Post Tenebras Lux (Carlos Reygadas, Mexico/France) Another film that's divided audiences in each of its festival appearances this year, this new one from Reygadas has been on my radar for some time. His films to date are in equal turns rapturous, provocative, and equivocal, but certainly never boring and often quite beautiful. Some critics are apparently growing tired of Reygadas’ ephemeral style, as Geoff Andrew labels it in his review for Time Out London, a “frustratingly vague achievement.” Color me intrigued. 2. Leviathan (Lucien Castaing-Taylor, Verena Paravel, U.S.A.) Virtually every festival report I've read about this documentary has been glowing. 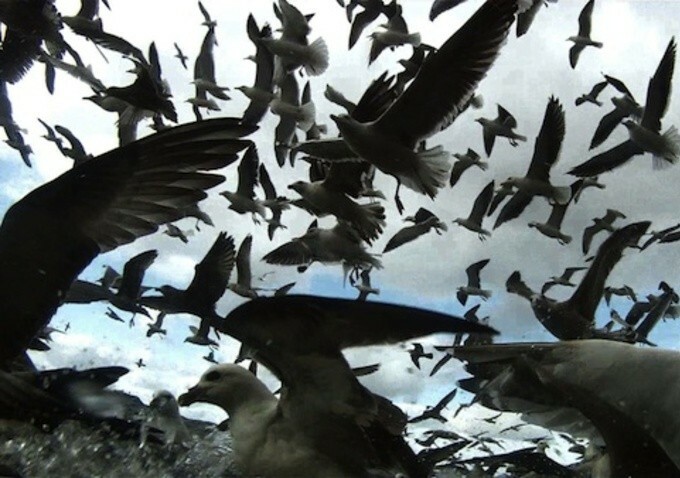 Directors Lucien Castaing-Taylor—the Harvard anthropologist who made the brilliant Sweetgrass (2009), about sheepherders in Montana—and Verena Paravel hopped on board a fishing vessel and captured images that evoke the terrifying majesty of nature. Considering how the film has been described as exhilarating and awe-inspiring, the minimalism that gave Sweetgrass its ethereal feel likely doesn't reappear in Leviathan. But surely the amplification of Castaing-Taylor’s unique harmonization between man and nature should make for yet another unique viewing experience. 1. Holy Motors (Leos Carax, France/Germany) This caused nothing short of a craze when it premiered at Cannes, making the latest film from Carax perhaps my most anticipated film of the year. Representing the last strands of the French New Wave, Carax is a truly idiosyncratic filmmaker. Audiences may know him best from "Merde," his contribution to the anthology 2007 film Tokyo!, but Carax has been a major filmmaker since 1984's Boy Meets Girl. Uninhibited by genre and decidedly feverish in tone, Carax's films represent a truly unique vision that's by equal turns comedic, perplexing, and maddening. Holy Motors, which reunites the director with his long-time collaborator and narrative stand-in Dennis Lavant, is simply the latest in what is an incomparable body of work. Honorable mentions: Cristian Mungiu's Beyond the Hills, Tae-Kyeong Kim's Don't Click, Everadi Gonzalez's Drought, Zhang Yang's Full Circle, Juan Antonio Bayona's The Impossible, Adel Yaraghi's Meeting Leila, Apichatpong Weerasethakul's Mekong Hotel, Tudor Giurgiu's Of Snails and Men, Ulrich Seidl's Paradise: Love, Matteo Garrone's Reality, Rodney Ascher's Room 237, Antonio Campos's Simon Killer, Olivier Assayas's Something in the Air.